Introducing the new NI TestStand 2010 Sequence Analyzer. 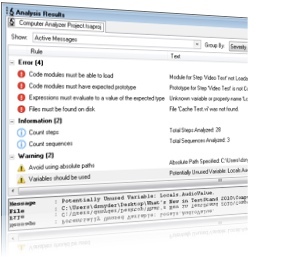 The NI TestStand Sequence Analyzer entirely changes the approach to NI TestStand sequence development and drastically reduces the amount of time developers will spend identifying erroneous code or enforcing development best practices. This webcast describes and demonstrates the new and improved features for team-based development and deployment introduced in NI TestStand 2010. View a webcast on how to create high-performance stream to and from disk system with up to 2.8 GB/s data rates. Create ANSI C host applications to communicate with user programmable FPGA hardware.